It probably was in the year 2000, on a common vacation in Thailand when Hans-Jörg Jäger asked his mother, whether she could imagin to live in his wife Lanee Jäger’s home village. To the surprise of both of them his mother affirmed the question but with the reservation wishing to live in a community where German is spoken and where one meets to play sociable Jass (Swiss card game), but one can also withdraw in one’s own four walls if one feels the need of peace. – The idea for a senior citizens residence in Thailand was born. 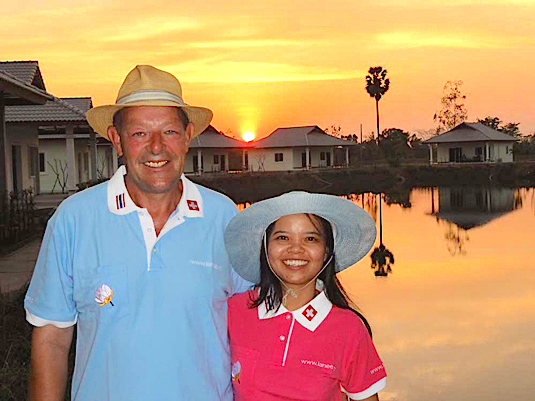 For about 10 years Hans-Jörg and his Thai spouse Lanee elaborated from now on on the project, to realize a senior citizens residence in the home village of her. In 2011 the time had come and the Tai-Swiss married couple could ceremoniously open their residence for German speaking senior citizens. – It was respectfully named Lanee’s Residenz. With the range of services of Lanee’s Residenz, German speaking senior citizens shall be enabled to spend the stage of life, which is not seldom accompanied with worries and physical problems, free of existential fears and in an on all counts pleasant environment. Not luxury is the focus but services and amenities which make sense and which are payable. In a community, far away from the well known Thai tourist centers, with like-minded, in which hower, each one in his bungalow is his own caretaker. Originally it was planned to aime only autonomous and lusty senior citizens and the 60plus generation who would like to spend their second stage of life in Thailand. But then a while later, the senior citizen who was so autonomous and lusty in the beginning, suffers from smaller or more serious worries which regularely occure in this stage of life. Some need support just occasionally until they need extended support and care. The subject of dementia and Alzheimer became more important. Not only internally in Lanee’s Residenz but also more generally in Thailand. And this is why Hans-Jörg and Lanee decided, to accommodate people who are affected by dementia as well as their relatives in Lanee’s Residenz, in parallel to the original residents. Today reside and live autonomous and still lusty senior citizens as well as dementia affected people in Lanee’s Residenz. Annually and returning, a lot of vacation guests and so-called «Time-outers» who wish to escape from the daily stress or the European winter for some weeks or months, mingle with our residents. Lanee’s Residenz is often visited by relatives or guests. For just a few days or even for one or several weeks. Please do not hesitate to contact Lanee’s Residenz. Hans-Jörg and Lanee will gladly answer your questions in a personal meeting, over the phone or in writing via e-mail or letter.